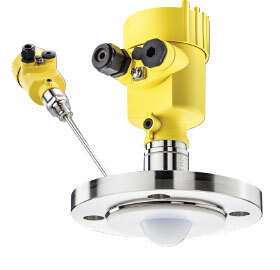 Radar is one of the most common level measurement technologies in the instrumentation market. Whether measuring liquids or solids, from chemical plants to wastewater facilities to ready-mix cement manufacturers, radar provides accurate, reliable level measurement without ongoing maintenance and frequent recalibration. Radar sensors are not only a trusted means of pinpoint level control, they are easy to use as well. Radio microwaves are transmitted by the antenna system of the sensor to the measured product, reflected by the product surface, and received by the antenna system. The microwaves travel through the air, hence the label, through-air radar. The time of flight from emission to reception of the signals is proportional to the distance to the product surface. The longer the time of flight, the greater the distance. This distance is inversely proportional to the level in the tank. The greater the distance, the lower the level. Many parameters determine the strength of the signal returned to a radar sensor. An agitated, turbulent surface will affect signal strength, as will distance to the product surface. Even normal process conditions like build-up on the antenna system may influence a return signal. Signal strength also depends partially on chemical composition, as not every product reflects microwaves equally. Conductive products reflect almost all microwave energy and non- conductive products reflect only a portion of the energy. Non-conductive products with low dielectric constant, oil for instance, produce weaker signals than those with high dielectric constant, like water. The range of signals a radar sensor can detect is called its dynamic range. The focus of the microwave beam depends on a radar transmitter’s antenna size and its transmission frequency. The smaller the antenna, the wider and less focused the beam. The larger the antenna, the more focused the beam. This is why the development of liquid level sensors operating at 80 GHz transmission frequency was such enormous news in process automation. VEGA has seen the practical benefits of 80 GHz level sensors, the VEGAPULS 64 and VEGAPULS 69, in over 70 000 installations worldwide per year. In containers and silos with many internal installations, enhanced focusing helps reduce the influence of noise created by microwave energy reflecting back to the antenna from something other than the product surface. Noise is commonplace in vessels with agitators, baffles, or heating coils, and it is sometimes created by the walls of the vessel itself. Noise is a problem because it distorts level measurement, but it can be overcome. The most obvious advantage to using a through-air radar sensor is that it is a non-contact level measurement that requires less maintenance due to a lack of moving parts and a lack of contact with corrosive product. Through-air radar sensors are unaffected by fluctuating product properties or by changing process conditions such as temperature, pressure or intense dust generation because they use radio waves to make a measurement. Few process variables can disturb the flight of a radio wave, making through-air radar sensors a reliable option for level measurement. Radar level transmitters are used for non-contact level measurement of liquids and bulk solids, even under high pressure and extreme temperatures. They can be used in simple as well as in aggressive liquids and are suitable for applications with stringent hygiene requirements. Radar level sensors measure light as well as heavy bulk solids with absolute reliability, even in the presence of dust and noise, without being affected by build-up or condensation. Through-air radar has tremendous capabilities and offers many benefits to users. However, through-air radar is not a level measurement panacea; it is not applicable for use with every product. In applications with rampant, heavy foam, radar is sometimes not the right solution because microwaves can be absorbed right into the foam. Another limitation is that in order to use radar for level, a user must have a connection at the top of the tank. The connection can be small, but it has to be present. Through-air radar is a great fit for the vast majority of applications, even those with foam, but not all of them. Users should discuss the specifics of their level application with their instrument providers before choosing a technology. Through-air radar instruments are more focused than ever before, making them a reliable option in vessels with obstructions or applications that require isolation valves. Some instrumentation manufacturers are pairing this hyper-focus with incredible sensitivity and intelligent software so that users can measure non-conductive products and suppress noise from false signals. High transmission frequency sensors have made antenna sizes smaller than ever, so retrofitting and mounting are less costly and less burdensome than ever before. Any users who have shied away from radar in the past should rethink their position; any users relying on an older radar sensor should consider an upgrade. The instruments are just that good.